After the night tour of Nagoya, it was time to board the bus to Tokyo. It was all easy-breezy to do so, when we were already at the bus terminal. But this was a different story as we were roving in the city the previous day, trying to find the ticketing counter for the budget bus from Nagoya. We embarked on our mission from Nagoya Station, where we had the option to catch the Shinkansen (the bullet train), but it was going to cost us almost 11,000 Yen per person or around $110. The good thing was, that on the station there was free, fast wi-fi, which helped us to check the different bus companies that were offering tickets to Tokyo. The prices vary from 2,000 to 6,000 Yen and this was a much better option for us, allowing us not only to save some money, but to explore the countryside of Japan, during the trip. Not that this wasn’t going to be possible if we were to catch the Shinkansen, but imagine to try to see something while passing through with 300km/h. So now that we knew what type of transport we wanted to catch we needed to find the budget bus ticketing counter. If you try to Google this, you will find everything else, but the right address you need to go. We decided to let our hair down and to visit the Information counter situated in the centre of the station. Inside, a rather old lady greeted us with a smile and a perfect English accent (I felt ashamed by my own). After hearing us out she took an A5 sized book with laminated pages and pointed out a small map written in Japanese. This was such a National Treasure moment! If we had to follow the map, we had to walk across the station and to exit on the other side, where exactly opposite McDonalds we were to find a JR Express counter. The JR Express tickets were on the expensive side, but without clear directions to another counter we had no other choice. The overcrowded station resembled a busy bee hive. The sound of traditional Japanese music, that was coming from the gift shops was mixed with the rhythms of modern k-pop, playing from the near by shop kiosks. Like a breath of fresh air, the geishas were bringing some colour with their silk kimonos, to the otherwise blended crowd. We could see the exits to the various train platforms, and the passengers rushing to catch their train. 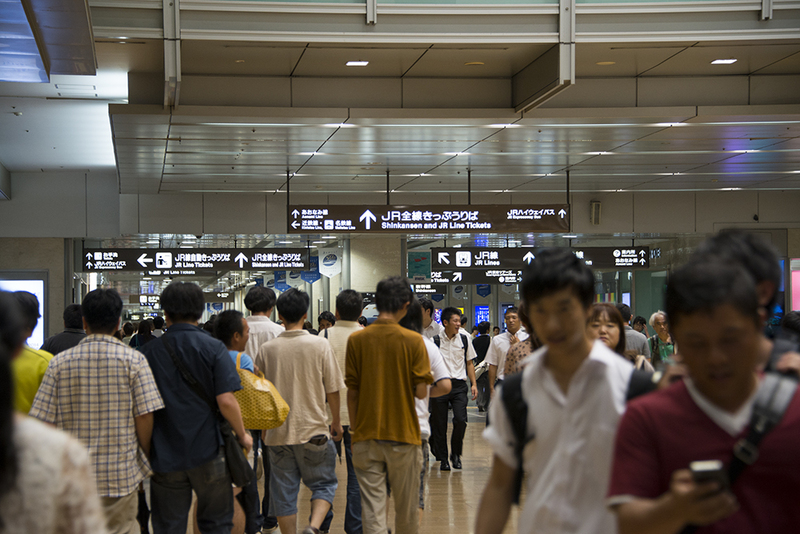 To get to the ticketing counter, you should follow the signs to the Meitetsu Station. We got to the JR Express counter (opposite McDonalds at Nagoya Station) and tried to purchase a ticket from the sales person. Unfortunately the otherwise kind lady didn’t speak English and it was really difficult for us to understand what she was trying to tell us. She was smiling politely, while talking in Japanese, before her smile turned into a nervous expression. She took out almost the same map, as the lady from the Information centre, pointing to another ticketing counter, somewhere at the other end of the station. We didn’t have any other option, but to try to find the other company, which name we didn’t even know. the map showed the counter right outside the other end of the station (the front of the building), but in reality it was hidden on the second floor of the neighbouring shopping mall. To get to it we followed the signs to the Meitetsu Train Station. 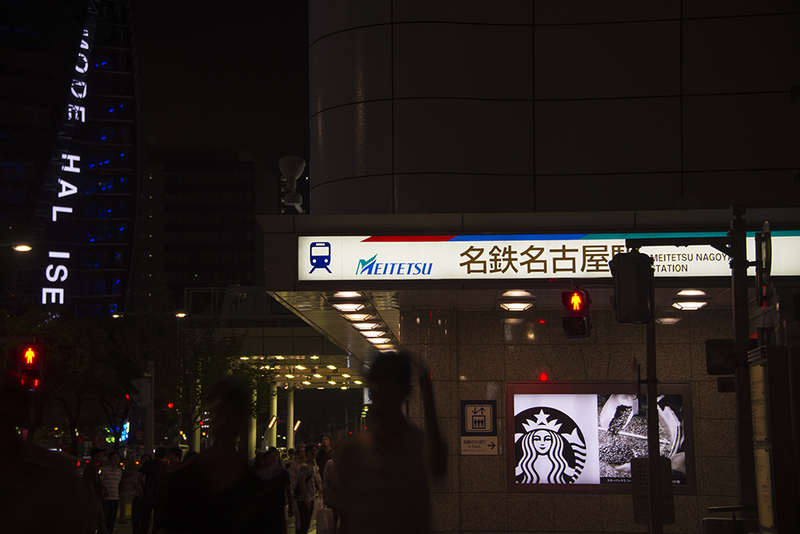 Tip: If you need to reach the ticketing counter, follow the Meitetsu signs, but don’t turn when you see the sign for the Meitetsu train station. Instead continue to walk few meters down the street and take the first escalator on your right side. 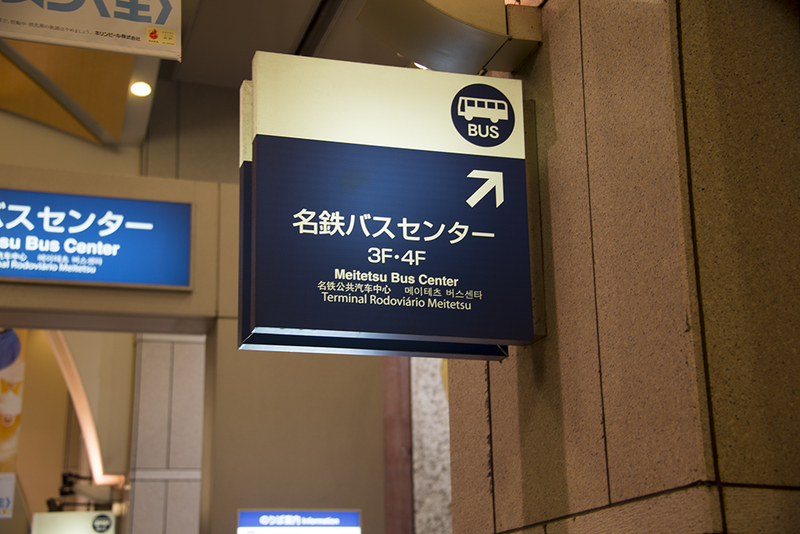 If you look closely, you will see a small sign Meitetsu Bus Centre right before you turn for the escalator. It will take you in front of the ticketing counter, without you having to navigate your way through the shopping mall, which feels more like a maze. There is a direct elevator to the ticketing counter. After we explored few floors of the shopping mall, we managed to find the bus company. One of the salesman knew a bit of English so he managed to explain to us, that they had only tickets for the morning bus. He advised us to try to buy tickets for the express bus from the JR Express, suggesting it was going to be more convenient. Long story short, we ent back to JR, where another staff informed us they didn’t had any tickets left. We ended up buying the Meitetsu tickets for 5,000 Yen each. The bus was right on time and departed at the exact time according to the schedule. This was something we weren’t used to, being traveled to countries in Southeast Asia, like Malaysia and Indonesia. We made few stops along the way, where we were able to take a walk around the local markets and to stretch our legs. The buses in Southeast Asia may not be right on time, but they definitely had spoiled us, with the wide leg space and comfortable seats. Well, that definitely seems like a much better option for the wallet … maybe Japan is in line for a visit from me after all! can i get a ticket by online? You can check and book a ticket online at http://willerexpress.com/, one of the many websites that offer this service. The price may be slightly more expensive. It is always best if you can go and buy the ticket directly from the bus station. But of course if you are outside of Japan, this is the best option.